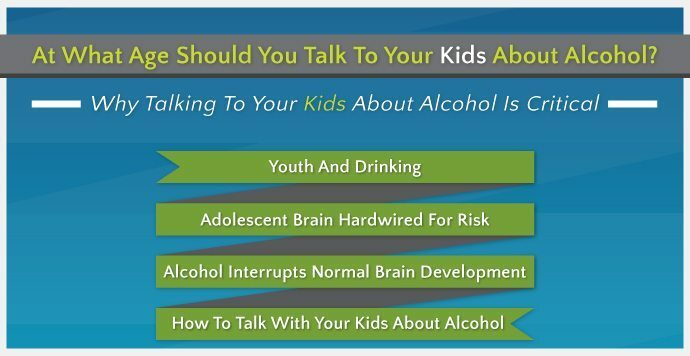 At What Age Should You Talk To Your Kids About Alcohol? Home › Blog › At What Age Should You Talk To Your Kids About Alcohol? Growing up in a household with one recovering alcohol-addicted person meant I was exposed early on to the influence of alcohol on the brain and the consequences of drinking. I was fortunate that my parents remained open about the process of recovery. Even before my teenage years, I had witnessed the effects of alcohol on our family, and was imprinted with a respect for the tendency toward addiction in our family. This awareness, and the lines of communication my parents maintained, kept me from participating in drinking in excess as an adolescent and well into my adult life. Parents often have to grapple with talking about subjects that seem uncomfortable or outside of appropriate age range, but in discussing these topics openly, children feel comfortable and encouraged to share and engage parents for advice when it comes to the pivotal years. And it’s important because alcohol is one of the most accessible drugs for youth. They can access it, in many cases, within the refrigerator, cupboard, or at a friend’s house, making it one of the most sought-after substances by individuals under the age of 18. Studies suggest that as many as one in five teens drinks regularly. General population-based studies indicate the average first drink occurring around the age of 12 or 13 years, so talking with kids before they enter the teen years is critical. Alcohol has a more dramatic impact on the underdeveloped brain, leading to long-term brain and nerve cell damage. Underage drinkers are more likely to participate in other drug use and are at greater risk for becoming alcohol-dependent in adulthood. From infancy to the early 20s, the brain changes dramatically. By the onset of adolescence, the brain has organized experiences, made associations, and developed pattern recognition that will aid in decision-making as an adult. At this stage, emotional centers of the brain are similar to that of an adult, but parts of the cortex that regulate impulse control, reasoning, and decision-making are late to develop. The cerebral cortex, specifically areas of the frontal lobe that control reasoning and decision-making, doesn’t fully develop until a person reaches their early 20s, which is why teenagers who participate in underage drinking tend to drink in excess and participate in greater risk-taking activities, including driving while drunk. Entering adolescence, mortality rates increase sixfold, with approximately 5,000 teens dying annually in alcohol-related incidents. While drinking alcohol, all functions of the brain, apart from reward centers, are depressed. Recent studies show that even drinking in excess on average two or three times per month can cause damage to white matter—the connective nerve tissue connecting grey matter regions of the brain. In scans of teens who do not participate in binge drinking, there was healthy white matter, but in scans of those participating in binge drinking, small dark areas appear, indicating an absence of viable nerve tissue. In addition, teens who participated in binge drinking compared with teens who did not scored poorly on tests relating to cognitive thinking. Young women seemed to score lower on areas pertaining to spatial recognition and young men exhibited shorter attention spans and a difficulty with short-term memory recall. Teens who participate in excessive drinking during their formative years are far more likely to develop a dependency on alcohol in their adult years. Apart from the physical toll alcohol can have on the brain and body, consequences from high-risk activities, like drinking while driving, can result in life-altering experiences and even prison terms. Saying nothing may send the wrong message that drinking is okay. How you begin talking with your kids about alcohol depends on their age. Children under 10 may question what alcohol is, or why they cannot have it. This is an opportunity to engage the child in why drinking is something that is not safe for them, but is okay when adults drink responsibly. Between the ages of 10 and 12 is a good time to share your insights into how alcohol can make you feel. Be honest with your child. You might explain that alcohol can make people feel different or make them act funny, but explain that after a while, it can also make them feel sick. Talk about the risks of drinking and set clear guidelines about what you expect from your child, always leaving the door open for an ongoing conversation. Clearly-defined rules about drinking have been shown to be effective in preventing underage drinking. At the same time, allowing your preteen the freedom to converse with you about pressures at school involving drugs or alcohol will keep the door open for support. Entering their teen years, youth are likely to have already witnessed other people their age engaging in underage drinking. This is the critical time for them socially and developmentally. You may practice helping them cope with peer pressure, acting out scenarios and giving them the confidence to say “no.” Have these conversations when there is time to talk, to listen, and to explore the topic with your child. At this age, helping your child examine scenarios and guiding them to make healthy decisions will be advantageous for them and for your relationship. Asking them to weigh their decisions against consequence will help them develop good decision-making skills, including whether or not they should drink. In addition, offer alternatives to situations that might arise. Explain to your child that they can call on you for help in any situation, even if it seems like one that might get them in trouble. For instance, you might let them know that if they end up at a party in which drugs or alcohol are being used, or if they find themselves needing a ride when their friends have been drinking, that you will pick them up, no matter the time of night or scenario. Remind them you are there to help and be of support. This doesn’t negate rules, but will maintain an avenue of open communication that could potentially save your child’s life. Most importantly, if you have suffered with a drinking problem in the past, or know of a history of alcoholism in your family, be honest with your child. It’s okay to admit to the mistakes you have made as they relate to consequence. Explain what you learned from those experiences, talk about the risks in some families, and give your child a chance to ask questions and explore the topic openly. They will be more likely to engage you later if they feel you are open to listening. Adolescence is a critical period of time. So many changes are taking place within the brain and the body, not to mention social changes, that your child needs someone they can turn to for support without judgment. If your child does engage in drinking, try to keep this line of communication open. Use this opportunity to talk about safety and potential consequence. If you suspect your child has a more serious drinking problem, professional help is available. If you have questions and need to talk with someone about concerns over your teen’s use of alcohol, or if you are a teen and in need of help, please contact AlcoholTreatment.net. Speak to someone in confidence who will listen and offer support.